Before anything else, I need to point out that I have a vested interest in this volume. There is a photograph on Page 77 of RSS Swordsman, a modernised Västergötland boat on the Singapore Navy. The photograph was taken by me at a Republic of Singapore Navy Open Day at Changi Naval Base. Having said that I look forward each year to the release of the World Naval Review with its summary and roundup of the world’s navies. This edition is the tenth annual edition, but regrettably I have only been reading this publication since 2018. I am thinking of starting to look for copies of the previous editions. The introduction is a great place to start reading the Review as it lists the top 10 countries by defence expenditure over the ten years 2008-2017. It then looks at defence budgets and plans and follows that with a summary of the change in type of the Major Fleet Strengths for the ten years 2009-2018.
which partly reflects the change in roles of the RAN over that 10 year period. Similar comparisons exist for the US, Royal, Brazilian, French, Italian, Spanish, Russian, Chinese, Japanese, Korean (both), and Indian navies over the same ten years. The regional review then looks at the strengths of major regional navies. For example, the Americas lists current strengths for Argentina; Brazil; Canada; Chile; Colombia; Ecudor; Peru and the USA. 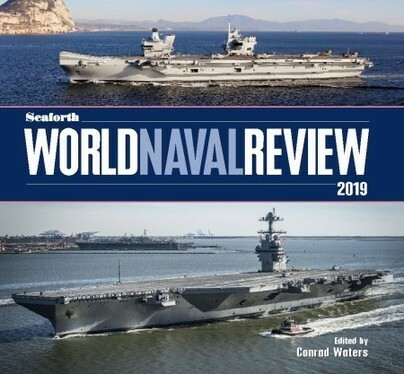 Given that the cost of regular updates from Janes is beyond most of us, World Naval Review becomes my go to publication for a review of the recent past as well as what is on the horizon for the near future. This is one of my favourite reads along with Warship. The book is available on both sides of the ditch, published by Seaforth, an imprint of Pen and Sword and also available through the US Naval Institute Press, along with Amazon, Book Depository and so on. It was published in hardcopy, ePub and Kindle versions.